Scott York and his wife, JoAnn, at his 2015 campaign kick-off last week in Leesburg. Scott York believes “Loudoun County is a very special place …. not only number one in Virginia, but number one in America.” After devoting the past 19 years of his life helping the county get to that point, he cannot in good conscience all it quits, York said at his 2015 campaign kick-off last week in Leesburg. Elected to the Loudoun County Board of Supervisors for the first time in 1995, representing the Sterling District, York then won the at-large seat as Board chair in 1999, an office he has held ever since. At the campaign event, York listed challenges the Board has addressed during his years at the helm, and successful outcomes Loudoun residents are now seeing. 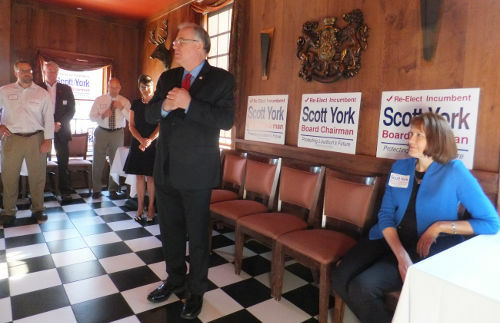 When York made the decision earlier in 2015 to “focus somewhere else” and leave public office, he expected one of the current supervisors to step up and seek the chairman’s position. Unfortunately that has not happened. I cannot fathom leaving the county in inexperienced hands, and I cannot fathom leaving the Board with Eugene Delgaudio’s attorney …. We are in a crucial four-year period coming up. Loudoun County has been a rural community that has gone through a lot of growing pains, and we’re now going over that hump. There’s a lot that still needs to be done. Ticking off a list of his key “promises made, promises kept,” York began with the status of Loudoun County’s rural economy, an area of great concern for past Boards seeking to balance property rights, economic development and preservation. We had a choice: Let it all go to housing, or scale back. But in scaling back, making sure that we provided the opportunity for landowners to be able to make money. So what we did was work with the farming community, to do what we could from a government standpoint to make it easier for folks to be able to invest in their property and do unique things with farming …. In the course of the last decade, we’ve been able to turn around the rural economy. One of the main promises kept during the current Board term, York said, has been to improve transportation. In addition to the Board’s vote to bring Metro to Loudoun, York noted his initiative to direct two cents of real estate tax to transportation projects as nearly $13 million of about $750 million in Loudoun’s Capital Improvement Program, most of which is going to transportation. York is also a member of the Northern Virginia Transportation Authority, which is providing tens of millions in funding to Loudoun projects. We need leadership at the helm that is experienced and knows what needs to be done and has a vision for Loudoun County …. It is a great place to live. It is a great place to raise a family. It is a great place to invest and do business. And my goal is to keep it that way.